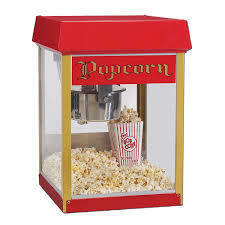 Our professional popcorn machine is very easy to operate, takes only minutes to prepare, and tastes as great as movie theater popcorn! Each rental includes 10 packets of pre measured kernels (15 servings) and 20 popcorn bags. Easy instructions included; needs table or stand.